The first part describes my work, and my work related interests. The second part is more personal about me and my hobbies. Raymond Agius is Professor of Occupational and Environmental Medicine and Director of the Centre for Occupational and Environmental Health at the University of Manchester School of Medicine. He is also an honorary consultant in the Central Manchester and Manchester Children's Hospitals NHS Trust and at South Manchester University Hospitals NHS Trust. His previous appointments have included being Senior Lecturer in Occupational and Environmental Health at the University of Edinburgh and before that Director of Medical Services at the Institute of Occupational Medicine. His research interests have ranged widely from occupational to environmental ill health including respiratory and cardiovascular disease, stress and back pain, and audit and quality in the delivery of occupational health services. He has particular research interests in the incidence of occupational disease and work related ill health, in air pollution epdiemiology and in methods of predicting new hazards - with a view to appropriate preventive measures. He has a special interest in education in occupational medicine especially utilising the internet and other innovative approaches. His book 'Practical Occupational Medicine' is now in its second edition. He is a Fellow of the Royal Colleges of Physicians of London and of Edinburgh, a Fellow of the Faculty of Occupational Medicine of the Royal College of Physicians of London and an Honorary a Fellow of the Faculty of Occupational Medicine of the Royal College of Physicians of Ireland. He serves or has served on several national and international committees, governmental and non-governmental bodies, and is a past president of the British Occupational Hygiene Society. Raymond Agius is fluent in four European languages and has lectured widely. His 'eponymous' lectures or orations include the Donald Hunter lecture (Faculty of Occupational Medicine, Royal College of Physicians of London), the Smiley lecture (Faculty of Occupational Medicine, Royal College of Physicians of Ireland), the Ferguson Glass oration (Australasian Faculty of Occupational Medicine, Royal Australasian College of Physicians) and the Heijermans lecture (University of Amsterdam). Honorary Consultant Central Manchester and Manchester Children's Hospitals NHS Trust and South Manchester University Hospitals NHS Trust. Senior Lecturer (Occupational and Environmental Health) at the University of Edinburgh Medical School. Honorary Consultant (Occupational Medicine) at the Lothian University Hospitals NHS Trust. Honorary Professor (Occupational Health) at Heriot-Watt University , Edinburgh. Director of Medical Services, Institute of Occupational Medicine. I had worked in anumber of NHS hospitals in London and the South of England, including the Royal Brompton in London (where my interest in Occupational Medicine was kindled), and the Southampton University Hospitals. Developing teaching and learning resources for, and lecturing and assessing undergraduate and postgraduate University students on medical or other health related courses. I have a special interest in postgraduate teaching in Occupational Medicine and Health, especially through Distance Learning. I contribute to the Distance Learning in Occupational Medicine at the University of Manchester. My interests also involve responsibilities elsewhere, such as lecturing or examining for other Universities or institutions, in Britain and overseas. My main current research is in the hazard and risk assessment of various inhaled pollutants in the urban environment and in the workplace. You can find out about occupational asthma or about investigating the interaction of urban air pollution and health. However I have engaged in other research areas, such as cell biology of lung disease, occupational back pain and stress, and quality and audit of occupational health services. I still pursue some of these to a variable extent. I undertake an Occupational Medicine Clinic at Manchester Royal Infirmary, where I advise patients who may have work-related ill-health and who are referred by their General Practitioners or other consultants. I also have responsibility for occupational health for some health care workers. Other National Health Service related duties include committee membership and guideline development. I am a Fellow of the Royal Colleges of Physicians of London (having previously been a Licentiate and then a Member)and of Edinburgh, and have served on committees of both of these colleges. I am a Fellow of the Faculty of Occupational Medicine of the Royal College of Physicians of London (having previously been an Associate and then a Member). I have examined for this Faculty and have served as an elected member of its Board. In the year 2000 I became a member of the forerunner of the Higher Education Academy of which I am now a Fellow. I have also been a member of the Council and of the Executive of the Society of Occupational Medicine and had originally set up its website too. I was a member of the council of the Royal Environmental Health Institute of Scotland . I have had involvement in various learned societies and journals. 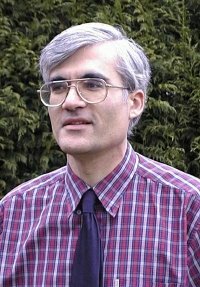 Thus I was elected President of the British Occupational Hygiene Society for the 1995/96 term of office, during which I established the Society's original website. Amongst the papers, chapters and other publications that I have written, I am co-author of the textbook Practical Occupational Medicine. You can also find me on LinkedIn and on ResearchGate but please do not email me via either of these portals. My hobbies or other interests. My hobbies include Personal Computing - both hardware and software aspects. I look after our family's Home Page, and other websites such as Health, Environment and Work and birgu.org. In the mid 90's when the World Wide Web was relatively new I set up (amateur) websites for a range of organisations such as the Society of Occupational Medicine, the British Occupational Hygiene Society, the Royal Environmental Health Institute of Scotland and the Heart of Midlothian Swimming Club. I have long since handed these over to the professionals. I like moderate amounts of gardening and 'DIY' - mainly of the 'dry' varieties e.g. carpentry and electrical work, since I am not as keen on the 'wet' stuff such as plumbing and painting. Once I was very keen on photomicrography and although this interest has lapsed, examples of my photomicrographs (as well as other photographs of mine) will be found interspersed amongst my on-line educational resources. Another lapsed interest was paleontology. I am a Master Scuba Diver, interested mainly in marine biology. I used to be active as site manager for my children's Lego, model railway and other modelling but now act as an 'ad hoc' consultant only. I have a growing interest in Melitensia and Maltese history, especially regarding Birgu (Vittoriosa) where my father's family hailed from. The accompanying image shows me (in the middle) on a snow mobile, well North of the Arctic Circle in Saariselka (Finnish Lapland), after I had been lecturing in Finland. I was enjoying myself on the snowmobile which, for me at least, is a much more stable proposition than a pair of skis. 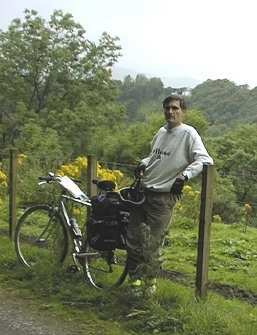 This photo shows me while on a short cycle trip in Midlothian (Dalkeith to Penicuik). When time permits I might add photographs (pending) showing me trekking on Exmoor in 2005, and in Kruger park in South Africa in 2009: Alternatively I might put them on Facebook! Number of website pageviews since 14.02.2000: .